Historia de una familia de granjeros de Oklahoma, que en los años de la depresión tienen que abandonar su tierra y marchar hacia la que imaginan como especie de paraíso terrenal: California. Realizan el viaje en un viejo Ford, pasando por diversas vicisitudes. 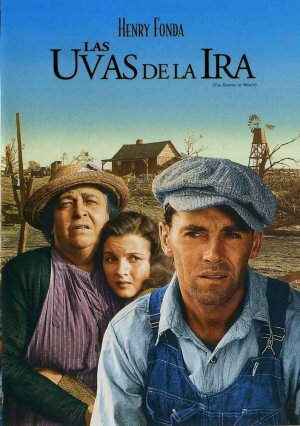 Henry Fonda, Jane Darwell, John Carradine, Charley Grapewin, Dorris Bowdon, Russell Simpson, O.Z. Whitehead, John Qualen, Eddie Quillan, Zeffie Tilbury, Charles Middleton, Douglas Walton, Shirley Mills, Kitty McHugh, Steve Pendleton, Adrian Morris, Grant Mitchell, Charles D. Brown, Paul Guilfoyle, Danny Borzage, Trevor Bardette, Roger Imhof, Constantin Frenke, Cliff Clark, Carmen Morales, Frank Sully, Charles Tannen, Harry Tyler, Carmen D'Antonio, Cyril McLaglen, Robert Homans, Darryl Hickman, Arthur Aylesworth, Frank Darien, Frank Faylen, Constantin Romanov, Mae Marsh, Harry Woods, Eddie C. Walker, Jack Pennick, Robert E. Perry, Tom Tyler, Rafaela Ottiano, J.M. Kerrigan, Hollis Jewell, Joe Sawyer, Billy Bevan, Selmar Jackson, John Arledge, Harry Tenbrook, Irving Bacon, Ward Bond, David Hughes, William Pawley. John Ford (Dirección), Gregg Toland (Montaje), Nunnally Johnson, John Steinbeck (Guión), Alfred Newman (Música).